"Imagine. You’re drowning. You reach for the surface, but it just falls farther away. You look for help, but everyone is at the surface, and they don’t even know that you are in a fight for your life. You long for a breath of fresh air in your lungs, but you don’t know where the next breath is going to come from. FaithWorks is 501 (c) (3) non-profit organization and all financial donations are tax deductible. Expenditures enabling one student to be trained total approximately $3500. Donations may be made online at this website. Online donations to Faithworks are simple and safe. Just click below and follow the instructions. You may set up an account if you plan to use online giving regularly, or click on "give now" to make a one-time donation. We offer this method of payment as a convenience. Local businesses provide supervised internships for our students. You are invited to enjoy having a student provide 60 hours of work for your business – all free of charge. Students who choose to learn more about your business or industry will benefit from experiencing the day to day operation over a 4 week period. FaithWorks provides two meals per day for students, with the noon meal being provided by volunteers. This meal can be cooked at home or brought in from a restaurant. This is the primary meal of the day for our students, and we try to make it a nutritious one. An important goal at FaithWorks is to remove the barriers that often keep our students from obtaining gainful employment. Having proper clothing for the business world is often one of those barriers. 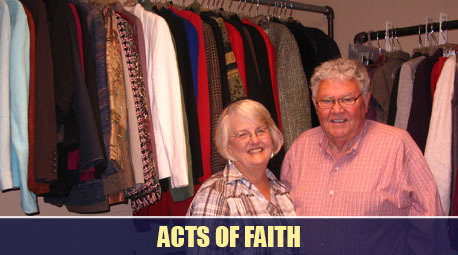 Therefore, FaithWorks provides a professional clothing closet for our students, which has been donated by members of our community. We also supply personal care items such as soap, shampoo, toothbrushes, razors and similar items when needed. Add some extras to your shopping cart, then drop them by FaithWorks for our students.